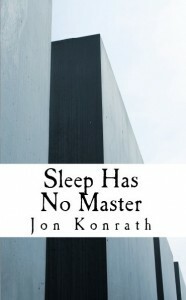 I’m proud to announce my new book, Sleep Has No Master, is now available in glorious dead tree print format. 234 pages of doesn’t-matter-if-you-drop-it-in-the-tub, readable-on-the-beach, loanable-to-friends, no-DRM, no-batteries-required goodness. If you read my previous book, The Earworm Inception, you’ll like this one. It’s 27 slices of absurd humor in the same breakneck style, loosely tied together into a novel. Check it out on Amazon here. There’s also a Kindle version available here. As was true previously, I’ve tried to make the price as low as possible to keep this affordable, but the print version obviously has a higher price than the kindle edition. Beaming electrons is always cheaper than chopping down forests.